MainAll NewsMiddle EastFrance Advancing Resolution on 'Settlements'? France Advancing Resolution on 'Settlements'? Senior officials say France intends to advance a UN resolution on Jewish communities in Judea, Samaria and Jerusalem. France intends to advance a United Nations Security Council resolution on Jewish communities in Judea, Samaria and eastern Jerusalem, senior officials in Jerusalem and Western diplomats told Haaretz on Saturday. French Foreign Minister Laurent Fabius made a comment to that effect ten days ago, at a meeting in New York of the foreign ministers of the Middle East Quartet countries, according to the newspaper. Prime Minister Binyamin Netanyahu made use of the comment to convince right-wing members of his cabinet that new construction in Judea and Samaria in response to the recent wave of terrorism would cause Israel severe diplomatic damage. The September 30 meeting in New York was due to include the foreign ministers of the Quartet countries — the United States, European Union, Russia and the United Nations — as well as those from Jordan, Egypt and Saudi Arabia. The French foreign minister had other plans, however. Two Western diplomats and two senior officials in Jerusalem told Haaretz Fabius demanded to participate in the meeting as well and exerted strong pressure on the Americans and on EU foreign policy chief Federica Mogherini. In the wake of the pressure, it was decided initially that France, Britain and China, all of which are permanent members of the Security Council, would also be invited, even though they are not direct members of the Quartet. The prospect of their participation, however, led other countries, such as Germany, Norway, Japan, Italy, Spain and others, to demand a place at the table as well. According to Haaretz, the result was a conference of 30 foreign ministers from around the world, discussing the Israeli-Palestinian conflict without a single Israeli or Palestinian representative. A statement in summation of the meeting — mainly ceremonial and with short statements by each of the participants — was agreed upon in advance, the newspaper says. 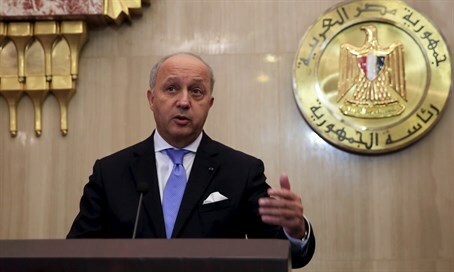 Fabius again surprised the gathering by presenting a French diplomatic plan with steps that he said would break the deadlock in the peace process. According to Western diplomats present and the meeting as well as senior Israel officials briefed on the details, Fabius said he was interested in convening a follow-up conference in Paris to which countries interested in advancing a solution to the Israeli-Palestinian conflict would be invited, but not the two sides themselves. According to the diplomats, Fabius then said there were many parties pressing for a vote on a Security Council resolution on the “settlements” and the subject was being explored. Reports of Fabius’ statement reached Israeli diplomats and Netanyahu, who was in New York at the time, within a few hours. Like most of the participants at the Quartet meeting, Netanyahu and his advisers were surprised by the process Fabius proposed in his remarks. The Israeli leader’s advisers were quick to speak to associates of U.S. Secretary of State John Kerry and others who were present at the Quartet parley. The following day, Netanyahu raised the issue at a meeting with Kerry and expressed great concern. The Americans said they do not know what Fabius intends and had no additional information on the subject. A senior Israeli official told Haaretz that from inquiries made in subsequent days, it turned out that it was apparently a process that was only in its initial stages. The latest move comes a month after French Economy Minister Emmanuel Macron said Paris backs EU plans to label products from Jewish communities in Judea and Samaria, though he insisted France opposes any boycott of Israel. The labeling plan has been blasted by Israel which says it is the target of an international delegitimization campaign. France has also been promoting a resolution regarding peace talks between Israel and the Palestinian Authority, which would set negotiating parameters and establish a time period, possibly 18 months, to complete talks. International pressure has been mounting on Israel to resume peace talks, even though it has been PA chairman Mahmoud Abbas who has continuously imposed preconditions on peace talks.